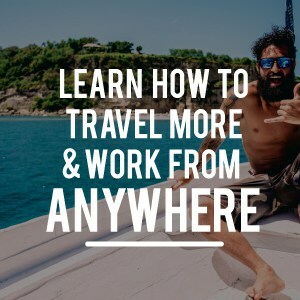 Running is an excellent way to stay in shape while traveling precisely because you don’t need much gear and it can be done anywhere and everywhere. You really don’t need anything more than shoes and some athletic wear. 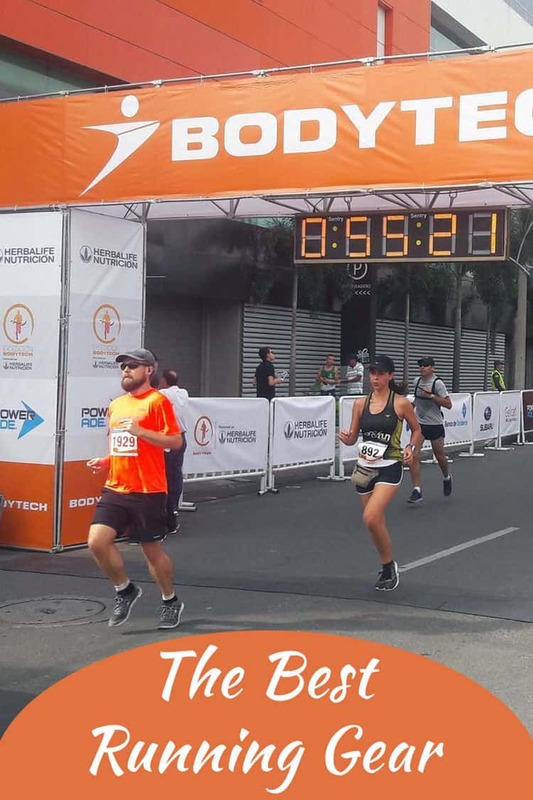 But after I started running for quite awhile, I then began to take running more seriously, and I started to up my mileage, I began looking for more quality products as I tried to find the best running gear for me. In this post I’ll be talking about some of the specific products I use and love (and why) and what I look for in a quality of piece of running gear so you can make your own decision. I’ll also be touching on a few of my favorite running apps, tools, and resources as well. A quick note on shoes: a decent pair of shoes is about the only thing you really need to get started running. Shoes are kind of a personal thing with lots of different opinions. 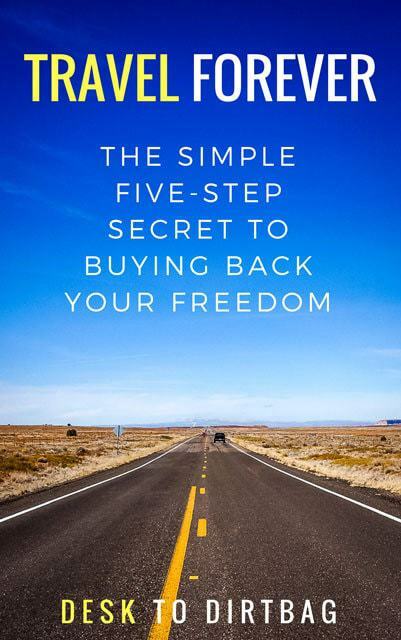 I personally don’t think you need to go spend top dollar on a pair of shoes that you need to replace every few hundred miles. 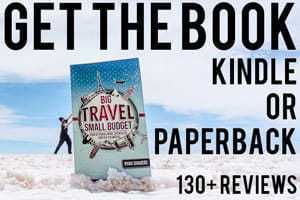 Find something affordable, comfortable, highly breathable, flexible, and not overly padded. That’s what I look for in running shoes. I just went for a cheap pair of super light and flexible runners for my latest pair. They have served me well. I don’t like shoes that have a big thick sole, I’d rather somewhat feel the ground I’m running on, but I also don’t buy into the whole barefoot running trend, either. I’d advise sticking to the middle ground. Shop Running Shoes on Amazon. I’ve got a number of shorts that I run in, but the Patagonia Nine Trails Shorts are my favorites, particularly for my long run days. 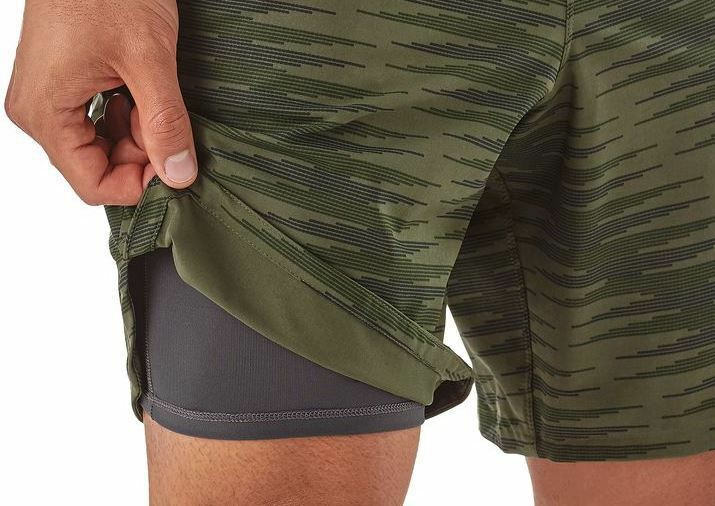 The primary reason that I like the shorts are the included boxer-brief liner (it’s like a double short) for chafe protection–definitely important when you start increasing the mileage. Beyond that I like the fact that the shorts are relatively slim cut–I don’t enjoy big billowy shorts that fly all over the place. Going hand in hand with that theme are the pockets, if you run with your phone or keys in your pocket like I do, you do NOT want shorts with big pockets and lots of space. Things begin to fly around, gain their own inertia and take on a life of their own. It’s really annoying. The slim cut of the shorts and compact pocket assure that there is no movement of my phone or other stuff. I also appreciate the fact that the pockets all have included zippers (so you’ll never lose anything), though I don’t really use the rear pocket. Some online reviews have mentioned that the shorts are hot. 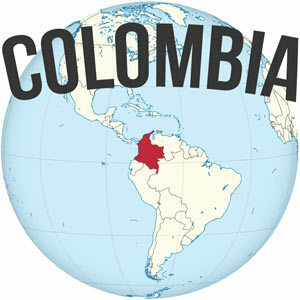 I really haven’t found that to be the case, and I do most of my running in the heat in Medellin, Colombia. The only thing that is poorly done on the shorts is that the drawcord is quite short. I can barely get a knot tied. Luckily the ones I got are very well fitted and thus the drawcord isn’t even really necessary. Buy the Nine Trails Shorts from Patagonia. Almost any shirt will do, so long as it is a polyster athletic shirt that wicks sweat and is a decent fit. I don’t find there to be any particular requirements for a good shirt beyond that, since I’m not using pockets or anything of that nature. Shop Running Shirts on Amazon. As you increase the running time beyond an hour or so, it’s helpful to have access to a little bit of food and water while on the go. I was unsure about adding a hydration belt since I’d never used one before, and wasn’t sure if it would be annoying or irritating to use. I tried on a few at REI, and found the Nathan Trail Mix Plus to be a very comfortable belt with very little movement, and it has quickly turned into a favorite piece of running gear. Now that I’ve been using it for more than a few weeks, I’ve got to say that I love having access to water and a snack. The belt really doesn’t move much at all, either, even when fully loaded with water. The belt features an adjustable elastic waistband, two holsters for 10oz water bottles, and a decent sized pack between the bottles for storage. I will use the pack for storing a granola bar or two, my keys in the internal velcro pouch, and sometimes my sunglasses when it’s overcast but maybe gonna be sunny. I really like the fact that the bottle holsters are a stiff plastic form which ensures that you can easily holster the bottles as you run down the road. I would not get a cheaper one with a formless fabric/elastic holder–those would be nearly impossible to holster while running. My only tip is to wear the belt a little higher up, right on your hip bones, and not on the waistband of your shorts which may cause irritation. Buy the Nathan Trail Waistpack from REI. My smartphone is probably my next most important piece of gear beyond the running specific items. Unless I’m running in an organized race, I listen to podcasts rather than music while I run. I use Podcast Addict for Android to load up my phone with plenty of great listening material. Some people prefer music to energize and motivate them while running, but I prefer listening to something educational or interesting. I also find that listening to podcasts and I don’t feel quite so disconnected from the world around me since I can still hear cars honking, people talking, etc. 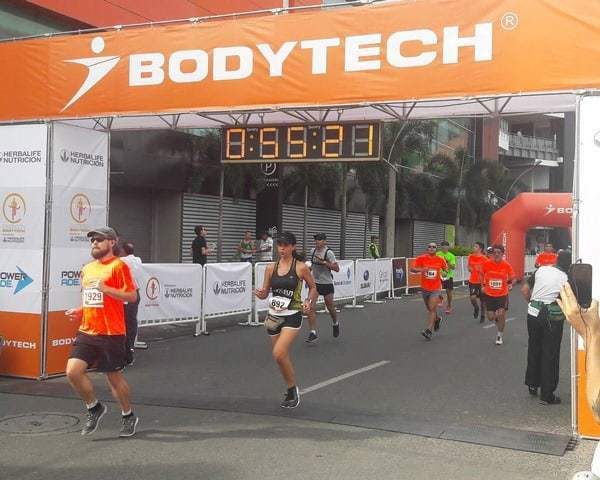 It can be dangerous to run when you drown out all outside noise with music — especially in a place with drivers as crazy as those in Medellin. I still remember a work colleague who got hit by a bus while jogging in D.C. Check out my list of favorite podcasts if you’re looking for some ideas. To listen to podcasts or music, you need a decent pair of headphones. Personally, I found that standard earbuds simply don’t work for me if I’m going out for a run that is more than half an hour or a few miles. They just start slipping out as I get sweaty and I’m constantly fighting to try and keep them in as I run. A pair of headphones that slips over your ear was a lifesaver for me. I’ve been very happy with these cheap Rovking Sport Headphones from Amazon. They are slim profile, fit nicely in my ear, and have never even threatened to fall out while running. The profile is so slim that I can even pop them in and sleep without them stabbing me in the ear. They are great headphones for running, or just in general, and they have held up great over more than a year. 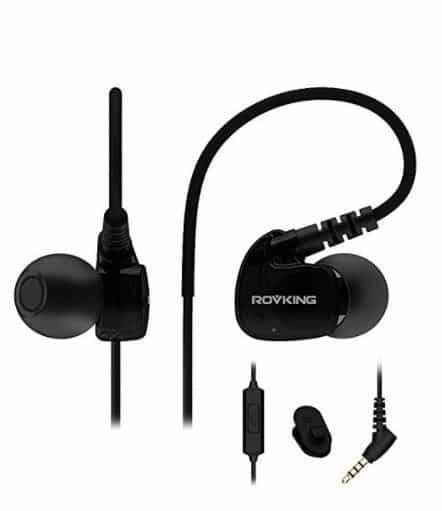 Buy the Rovking Headphones from Amazon. I love the fact that we can track so much these days, as I find it helps motivate me to keep it up. Strava has turned into one of my favorite running apps not only for the basic features that one would expect from a running app, like distance, speed, GPS tracked map, and so forth. But also for the fact that you can compete amongst friends or acquaintances for weekly mileage, speed, elevation, etc. It’s a real motivating factor if you’ve got a competitive bone in your body. Plus another great feature, especially while traveling, is their labs feature where you can look up the most popular running locations in a city in a sort of heatmap format. This is great when you don’t know an area well and are looking for somewhere half decent to run, as well discovering new routes to mix up your routine. Hope you enjoyed this post about what I’ve found to be the best running gear for me personally. Obviously every person is different, and you may have totally different needs. Really the best running gear is the gear you’ve got and the gear that keeps you getting out there. Have a tip on the best running gear or a favorite piece of gear you love? Sound off in the comments below. Did you enjoy this post about the best running gear? Please take a moment to share it on Facebook, Pinterest, or Twitter.